When another attack with chlorine gas is reported in Syria, it might help to check the evidence. This page is intended as a resource for that. It's a very basic start for now. The color should be pale green-yellow, or may appear yellow, or even white if thin enough. It should not be neon green, orange, or reddish-brown. It's heavier than air, and should hug the ground like a low fog. It can be whipped up by a blast or a breeze, but will fall again when it can. Two industrial spills in the United States are shown in this related blog post, showing a thick cloud can appear fairly rick yellow-green (more yellow), when it's thin enough the gas can appear almost white. 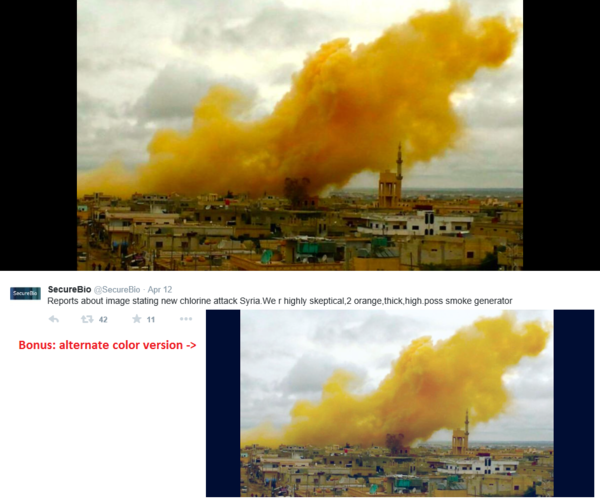 Too Orange: As noted by now-defunct CRBN firm SecureBio, this alleged chlorine plume of April, 2014, is too "orange, thick, high" and speculated a smoke generator. Here a screen grab of that tweet, with an added color-adjusted version. With a blue sky behind it, the plume looks even worse. And that's no heavier-than-air gas rising up and up like a sad child's lost balloon. Debatable example, Nov. 22, 2016, Aleppo (see here). At right, the image as found at left, color-adjusted at right. The color is probably too rich and too green, but not by far. The other problem here is how the (colored smoke?) rises into the air as it dissipates, rather than falling towards or moving along the ground, like chlorine would. Clinical signs, or more commonly symptoms, are the bio-medical indicators that help decide what poison might be responsible. Most of them are non-specific - can be caused by many different things. None can prove or disprove a certain poison, but enough consistent signs with no contrary signs is a strong indication of that poison. A good catalog of expected effects was described to Doctors without Borders (MSF) and Amnesty International following the March 16, 2015 alleged chlorine attack in Sarmin. Difficulty breathing or shortness of breath. Thesemay appear immediately if high concentrations of chlorine gas are inhaled, or they may be delayed if low concentrations of chlorine gas are inhaled. The French troops in the path of the gas cloud sustained about 6,000 casualties. Many died within ten minutes (primarily from asphyxia and tissue damage in the lungs), and many more were blinded. Chlorine gas forms hypochlorous acid when combined with water, destroying moist tissue such as the lungs and eyes. The chlorine gas, denser than air, quickly filled the trenches and forced the troops out into heavy enemy fire. The first effect of inhalation of chlorine is a burning pain in the throat and eyes, accompanied by a sensation of suffocation; pain, which may be severe, is felt in the chest, especially behind the sternum. Respiration becomes painful, rapid, and difficult ; coughing occurs, and the irritation of the eyes results in profuse lachrymation. Retching is common and may be followed by vomiting, which gives temporary relief. The lips and mouth are parched and the tongue is covered with a thick dry fur. Severe headache rapidly follows with a feeling of great weakness in the legs; if the patient gives way to this and lies down, he is likely to inhale still more chlorine, as the heavy gas is most concentrated near the ground. 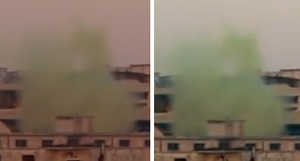 In severe poisoning unconsciousness follows; nothing more is known about the cases which prove fatal on the field within the first few hours of the "gassing," except that the face assumes a pale greenish yellow colour. When a man lives long enough to be admitted into a clearing station, he is conscious, but restless; his face is violet red, and his ears and finger nails blue ; his expression strained and anxious as he gasps for breath; he tries to get relief by sitting up with his head thrown back, or he lies in an exhausted condition, sometimes on his side with his head over the edge of the stretcher in order to help the escape of fluid from the lungs. His skin is cold and his temperature subnormal; the pulse is full and rarely over 100. Respiration is jerky, shallow and rapid, the rate being often over 40 and sometimes even 80 a minute ; all the auxiliary muscles come into play, the chest being over-distended at the height of inspiration and, as in asthma, only slightly less distended in extreme expiration. Frequent and painful coughing occurs and some frothy sputum is brought up. The lungs are less resonant than normal, but not actually dull, and fine riles with occasional rhonchi and harsh but not bronchial breathing are heard, especially over the back and sides. Headache is generally severe, and there is also considerable epigastric discomfort, due partly to the strain of coughing and partly to gastric irritation, as it is increased if an attempt is made to eat. The intense dyspncea of this asphyxial stage lasts about thirty-six hours, after which it gradually subsides, if death does not occur before. The patient, exhausted from his fight for breath, then falls asleep and wakes up feeling much relieved. A few hours later acute bronchitis or broncho-pneumonia develops. In severe cases the quiescent interval is short and the bronchitis very severe. The sputum is now viscid, yellow or greenish, and muco-purulent with occasional streaks of blood. Respiration becomes more shallow and rapid, and the rate may finally be even 70 or 80 a minute. The pulse is small and very rapid ; the temperature rises, and is often as high as 104. The patient may now become delirious. Pleurisy may occur, and in some instances empyema and gangrene of the lung have followed. After recovery from the bronchitis and pneumonia the patient remains weak and exhausted for a considerable time. He gets tired very rapidly and is unable to walk quickly or up hill without getting short of breath, even after the last signs of bronchitis have disappeared. He may continue to have attacks of dyspncea and cyanosis for several weeks. The frightful experience he has passed through often affects his nervous system, and some of the attacks are doubtless aggravated by apprehension. Headache, vertigo and dyspepsia may continue for several weeks. Chlorine gas destroyed the respiratory organs of its victims and this led to a slow death by asphyxiation. One nurse described the death of one soldier who had been in the trenches during a chlorine gas attack. “He was sitting on the bed, fighting for breath, his lips plum coloured. He was a magnificent young Canadian past all hope in the asphyxia of chlorine. I shall never forget the look in his eyes as he turned to me and gasped: I can’t die! Is it possible that nothing can be done for me?” It was a horrible death, but as hard as they tried, doctors were unable to find a way of successfully treating chlorine gas poisoning. Chlorine is a greenish-yellow, noncombustible gas at room temperature and atmospheric pressure. Its intermediate water solubility accounts for the effect on the upper airway and lower respiratory tract. Prolonged exposure to chlorine gas may occur because its moderate water solubility delays onset of upper airway symptoms for several minutes. In addition, the density of the gas is greater than that of air, causing it to remain near ground level and increasing exposure time. The odor threshold for chlorine is approximately 0.3-0.5 parts per million (ppm); however, distinguishing toxic air levels from permissible air levels may be difficult until irritative symptoms are present. As the concentration of chlorine gas exposure increases, the severity of symptoms and rapidity of onset increase. Concentrations above 400 ppm are often fatal. See also Tekkim Chemical Test Video‎ for what might be the effects of chlorine on caged rabbits. Claims of chlorine victims losing consciousness, often instantly, are common in reports from Syria. There are both explicit claims (Instantly, "I felt like I was going to pass out. I started running and I lost consciousness." White Helmet guy to HRW, May 2015) and implicit ones (the numerous cases where victims just passed out in their homes, passively kept breathing the stuff, and so "sat there and died.") However, this is scientifically incorrect, or at least highly debatable. Monitor on Massacre Marketing: does chlorine make you pass out? Detailed consideration, from literature, recent incidents, and other evidence, considered alongside the claims out of Syria. Short thesis statement: "If someone seems to just sit there and die from a chlorine attack, something unusual is probably at work." Did people die in this alleged chlorine incident? This can happen, if the person breathes too much of the gas for too long. Severe lung damage follows, breathing is impaired, the brain lacks oxygen, and that can lead to death, usually only after a struggle of several hours or even days. Usually, victims are able to get away from the gas before they breathe much, and suffer only mild symptoms. But most of those reported dead in these attacks are said to have lost consciousness at the start, and so never left their house, and slept through the fatal inhalation to follow. Rescuers would find them face-down inside and carry them out, perhaps atill alive but doomed. However, as [this article] at the affiliated Monitor on Massacre Marketing blog explains, this makes little scientific sense. Loss of consciousness may happen, but only after a long struggle, not right away, and perhaps never. So anyone who seems to just "sit there and die" in their home likely has some unusual explanation the opposition activists aren't telling you about. Grass and vegetation exposed to chlorine also become exposed to acid due to its water content. Green plants directly exposed will be bleached pale yellow afterwards. This page was last edited on 24 April 2018, at 09:51.